expanding your router's network coverage to its primary Wi-Fi dead zone. MRE220 is a compact designed gadget with quality performance. 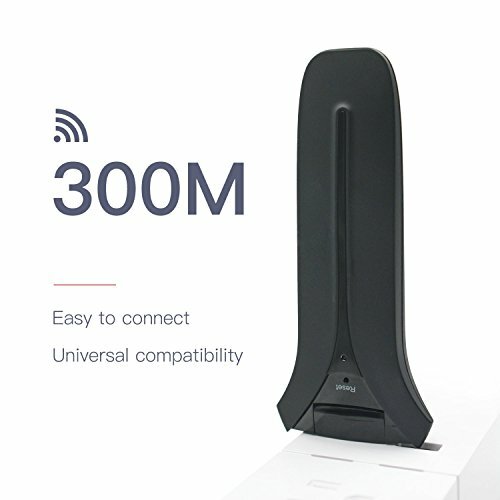 It works with any universal Wi-Fi routers. allowing the Wi-Fi repeater¡¯s deployment to run optimally undeterred by the location of the power socket. Extend Network WiFi: Ideal for extending WiFi to devices like the Amazon Echo, iPhone, Samsung Galaxy, HTC, iPad, Apple TV, Chromecast, Fire TV, Roku, Kindle, PlayStation and other phones & media players. Work with Various WiFi Router: Compatible with TP-LINK, Netgear, Dlink, Arris and other universal routers, Comcast / Verizon / at&t / Sprint / T-Mobile Gateways and other cable modem or IPTV boxes. Service Guarantee: 3-year guarantee and lifetime support. Please feel free to contact us without any hesitation and we'll find a solution until you are satisfied.